On any given day, a man is faced with situations that demand a response. He runs into a friend who was recently fired . . . His date can't seem to pry herself away from a texting conversation during dinner . . . Someone at his gym routinely monopolizes the equipment . . . He finds himself in a nearly unintelligible conversation with a client who has a thick foreign accent. In each of these scenarios, there are distinct responses that can determine the outcome-for better or worse. Knowing what to say is essential, because regardless of how many doors he opens or how often he remembers to bring a bottle of wine for the hostess, a gentleman's reputation is often established on his ability to communicate. In this updated version of As a Gentleman Would Say, John Bridges and Bryan Curtis offer simple reminders and new ideas for any man who is eager to navigate the obstacle course of his own words. 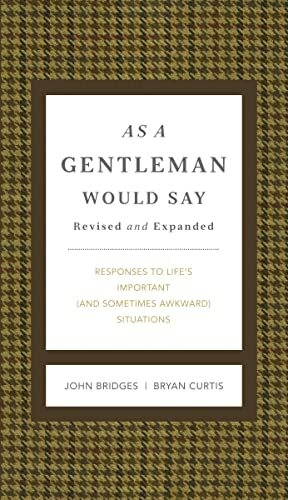 John Bridges, author of How to Be a Gentleman, is also the coauthor, with Bryan Curtis, of seven other volumes in the best-selling GentleManners series. He is a frequent guest on television and radio news programs, always championing gentlemanly behavior in modern society. Bridges has appeared on the Today Show, the Discovery Channel, and CBS Sunday Morning, and has been profiled in People magazine and the New York Times.